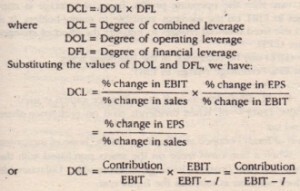 Thus, the DCL measures the percentage change in EPS due to percentage change in sales. 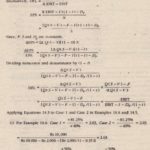 If degree of operating leverage of a firm is 6 and its financial leverage is 2.5, the combined leverage of this firm would be 15(6 x 2.5)). 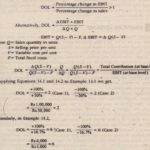 That is, 1 per cent change in sales would bring about 15 per change in EPS in the direction of the change in sales. The combined leverage can work in direction. It will he favorable if sales increase and unfavorable when sales decrease hen changes in sales will result in more than proportionate returns in the form of EPS. The usefulness of DCL lie, in the fact that it indicates the effect that sales changes will have EPS. Its potent in the' area of choosing financial plans for new firm begins to more than usual, the operating leverage obviously increase. If it DOL not change it financing policy, that is the Capital structure r constant, there would be change In its financial leverage. As a result, the combined leverage would increase causing an total risk. The firm in order to keep its risk constant like to lower it, financial leverage. This could be done, if the new investments are finance more equity than used in the past. 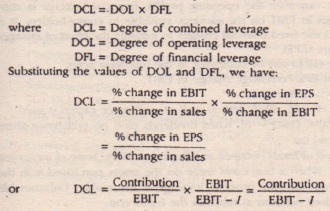 This would lower the financial leverage compensate for the increased operating leverage caused by investment in more risky operating leverage has decreased due to low fixed costs, the firm can afford to have levered financial plan to keep the total risk constant at the same lime having the same prospect of magnifying effects on EPS due to change in sales.